So why is the White House out to “de-legitimize” Fox? Not because it has opinions, but because its opinion voices are so hostile to Mr. Obama -- and because Fox News is, as it's been for a decade, by far the most-watched of the cable news networks, including a fair chunk of Democrats and independents. And by the way, since Mr. Obama has been President Fox's ratings overall have increased 13 percent -- actually, just since this summer. So. if Fox is feeling any pain from the White House's stance, Katie, it is crying all the way to the bank. KATIE COURIC: Politicians and the media have long had a contentious relationship. It's part of the American system, but we've never seen anything quite as intense as the feud between President Obama and the Fox News Channel. Our senior political correspondent Jeff Greenfield tunes in to that. 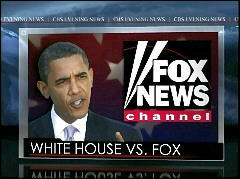 GREENFIELD: -the Obama White House is firing back, charging that Fox News is different from all other news. ANITA DUNN, WHITE HOUSE COMMUNICATIONS DIRECTOR, ON CNN: Fox News often operates almost as either the research arm or the communications arm of the Republican party. PRESIDENT BARACK OBAMA, IN NBC INTERVIEW: If media is operating basically as a talk radio format, then that's one thing, and if it's operating as a news outlet, then that's another. GREENFIELD: And the White House has gone beyond words. Last September 20th, the President went on every Sunday news show -- except Chris Wallace's show on Fox. And on Thursday, the Treasury Department tried to exclude Fox News from pool coverage of interviews with one of its key officials. It backed down after strong protests from the press. 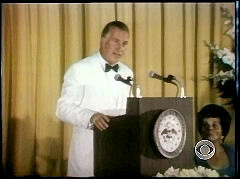 CBS NEWS WHITE HOUSE CORRESPONDENT CHIP REID: All the networks said, that's it, you've crossed the line. GREENFIELD: Tension between Presidents and the press is as old as the Republic. FDR was so incensed by the war reporting of one New York Daily News correspondent he tried to present him with an Iron Cross from Nazi Germany. John Kennedy tried to get New York Timesman David Halberstam pulled out of Vietnam; and Vice President Spiro Agnew's assaults on the network press are legendary. VICE PRESIDENT SPIRO AGNEW: We have more than our share of the nattering nabobs of negativism. AUDIO OF MALE VOICE OF SOMEONE OTHER THAN TAPPER: He was putting it in context and it made it sound like that was evidence of them not being a news organization. 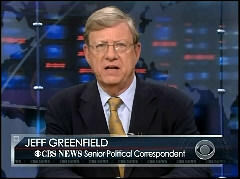 GREENFIELD: There's no question that Fox's prime-time voices come from the right. Moreover, its owner, Rupert Murdoch, is a staunch conservative and its first and only CEO, Roger Ailes, is a veteran of Republican media wars. But MSNBC in prime-time has its own lineup of commentators -- all of whom are on the left side of the spectrum, some of whom met with the President Obama at the White House this week. CBSNews.com online version of the story.